With so many e-mail accounts, social media pages, bank accounts and registrations, remembering every password is an almost impossible thing to do. For the average person, there are basically three options for remembering passwords: use the same password, be the Superman of memory or use a password manager. The first option is not recommended, while the second one works for a minority of the population. For the rest of us, the Dashlane iPhone app is the alternative. 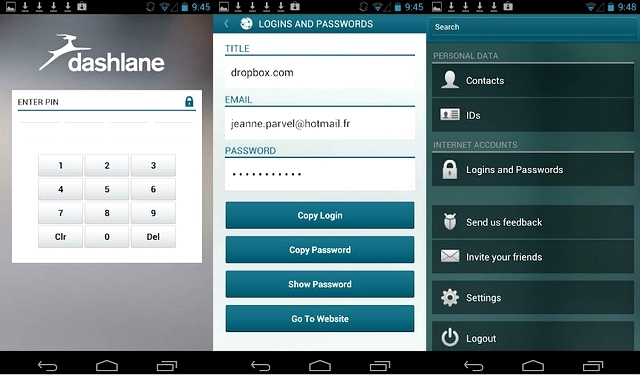 This application helps users to store their passwords for future use. Having a storage place for passwords is great. Being able to safely store ID, credit card data and receipts in one location is even better. With the Dashlane iPhone app, individuals can store all of the information that they are tired of continuously inputting online. Since so much information is stored in one location, the Dashlane iPhone app has to have the best security measures possible. Compared to the similar password managers, it performs fairly well. Through the security dashboard on the site, users are alerted about any security problems or breached passwords. Another security measure is the lack of a password reminder. If users forget their password to Dashlane, there are no reminders or password hints available. Once the Dashlane password is forgotten, the user can no longer access their information. Fortunately, this means that no one else can access the data either. To make it easier to store passwords, Dashlane will automatically ask users if they want to save their information. As users carry out their normal browsing, passwords will be saved and recorded. Overall, this makes the password uploading process easier and simpler than many similar programs. In addition, Dashlane can help users generate strong passwords for new programs and credentials.